Finding a quality dry cleaning company in the Melbourne CBD area isn’t a difficult job, especially with a company like Renes Dry Cleaning. If you’re a Melbourne local, you’ll know that Renes has been around for many years. 40 years, in fact, since the Jaramillo family started the business in 1977. Things have obviously moved on since then, with methods and technology changing over the years. Renes Dry Cleaning has changed with the times and has been operating their popular pickup and delivery service for ten years. What makes Renes Dry Cleaning unique compared to all the rest, though? Why choose us as your dry cleaning company in the Melbourne CBD area? The answer is that we are confident we have the very best service you can get. Apart from the pickup mentioned above and delivery service, we also have tailors who can make alterations and repairs. We dry clean wedding gowns and suits, and we have the ability to manage high volumes of dry cleaning a day. Also, we offer a pressing only service if you prefer to do the washing but don't like the idea of ironing. Most of all, though, we are a reliable firm that you can count on to do the job properly, every time. For the busy executive who doesn’t have a lot of time and is always rushing from one meeting to the next, we have a shirt dry cleaning service. Just drop off your shirts to us, and we will have them cleaned and pressed for you. We use a unique degreasing formula, and we add a personal touch by finishing each shirt off by hand. We don’t believe in bulk washing, so we make sure every shirt gets its own personal and individual attention, something we’re sure you’ll notice when your shirts come back to you in pristine condition, pressed and folded and ready for your next important meeting. We also cater for suits that cannot be washed in a traditional manner and require dry cleaning. As with our shirts, each suit receives individual attention so that it comes back to you in perfect condition. We're proud of our suit dry cleaning service in the Melbourne CBD, as we realise we’re performing a critical and necessary function to keep our Melbourne executives pristinely dressed. Renes Dry Cleaning have pledged to maintain good standards regarding the environment. Naturally, we use a certain amount of energy and chemicals when dry cleaning, and we aim to do this responsibly. For the past five years, all of our machines and equipment have been running on 100% renewable energy. 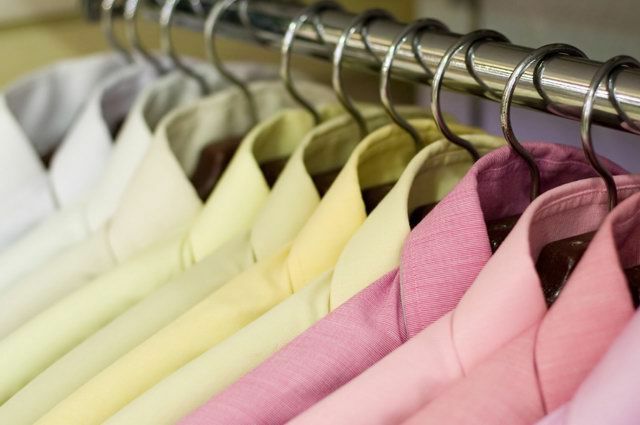 We also use the latest dry cleaning solvents such as hydrocarbon, which is excellent for cleaning fabrics, and also extremely mild on the environment as well.